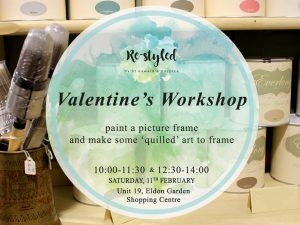 Eldon Garden / News / Valentine’s Workshop at Re-styled! Call into the Re-styled by St Oswald’s Hospice store or email re-styled@stoswaldsuk.org to book your place for their Valentine’s picture frame painting workshop on Saturday 11th February 2017. Either bring your own, no bigger than A4 size, or buy one on the day for between £3 – £5. You can even make some quilled art to put inside your frame. The painting workshop is free and quilled art is for a £5 suggested donation.